Grilling season is almost here and when it comes to family favorites, hot dogs and hamburgers reign supreme. 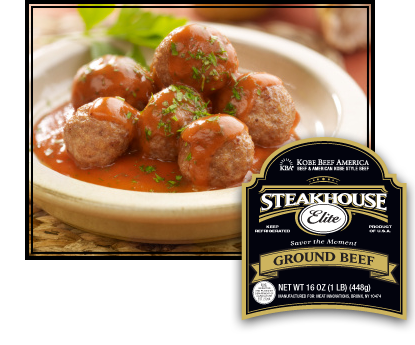 One company, Steakhouse Elite, is putting a gourmet spin on these beloved classics by incorporating flavorful American Kobe-style beef into their franks, burgers and ground beef products. An affordable option, Steakhouse Elite products come only from US-raised beef and are never frozen. Steakhouse Elite beef is also higher in monounsaturated fat, making it a healthier—but still tasty!—choice for the grill. You might think all hot dogs and hamburgers are the same, but that just isn't true. If you want your meats to come from only the best beef, than Steakhouse Elite is a great choice. Their Kobe-Crafted beef is rich in flavor and ideal in texture. Steakhouse Elite raises their Wagyu Cattle right here in the USA to ensure the highest standards for their customers. The result is superior beef products at affordable prices. My family was sent a variety of ground beef, hot dogs and hamburger patties to try out and they were definitely a big hit. As soon as the package arrived, the obvious high quality and freshness was apparent by the bright pink color of the meat. We tried the hot dogs first. Some were boiled and some grilled and either way, we could see and taste the difference between store bought brands as soon as they touched our lips. These hot dogs were plumb and juicy, and bursting with flavor. There was no grease left of the dish when I cut them up for my toddler, and everyone devoured them in seconds. Made from only 100% beef, these are hot dogs you can feel good about giving your family and proud to serve at barbeques. The ground beef was just as impressive. Even my husband, who is a chef by profession, had to admit that the hamburgers were some of the best he ever grilled. You could eat them by themselves with no condiments and still enjoy them. We received both ready made patties and ground beef we rounded out ourselves. The large patties were a little too big for our smaller kids so we used those for us and made smaller ones for the children. They were also super juicy and packed with flavor. You don't need any extra seasoning with these. My husband also made meat balls with one of the packages of ground beef and those turned out just as tasty. When it comes to quality meats, Steakhouse Elite has definitely impressed our family. 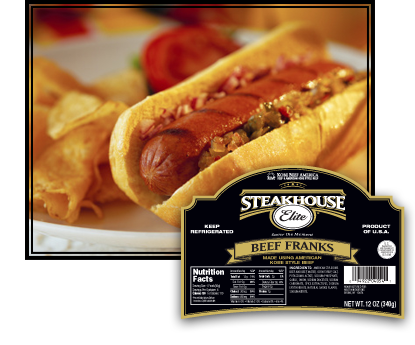 One lucky winner is going to receive a variety pack of Steakhouse Elite hot dogs, patties, and ground beef to try for themselves. To enter just fill out the rafflecopter form below Open to the US only. Giveaway will end 4/26/13. The winner will be notified via email and will have 48 hours to reply. Thanks again to Steakhouse Elite for offering this fantastic prize. I like that they use Kobe beef! I learned Steakhouse Elite grew out of a vision shared by two veterans of the beef industry who happen to live on opposite sides of the country. They have the legendary Kobe style beef. I learned they are higher in monosaturated fats which are the heart healthy kind, that kind of fat probably also gives more flavor and moisture to the meats too. I learned They have the legendary Kobe style beef. They offer products crafted from Wagyu beef. I learn they use US raised Kobe beef. I learned they were one of the first farms to raise wagyu cattle. All Steakhouse Elite Kobe-Crafted products are produced at USDA-inspected facilities. Ty sold his first pound of Wagyu beef as a teenager. They sell Kobe Ground Beef Burger. they" use only 100% American raised Wagyu"
I learned that the founders where from the east and west coasts. For Steakhouse Elite we use only 100% American raised Wagyu to ensure the highest standards of production and food safety for our customers. Their franks have "the perfect snap of a truly premium frank"! They use Kobe beef and their franks sounds extremely delicious. I learned steakhouse elite operates from its offices in both New York and in Oregon providing service to large retailers and distributor partners nationwide to deliver affordable products crafted from Wagyu beef for the discerning American palate. if you dont see them in your grocery store you can tell them to go there! I learned their burgers taste better due to the beef. I learned they have kobe beef. I learned that Steakhouse Elite grew out of a vision shared by two veterans of the beef industry who happen to live on opposite sides of the country. I learned that they use Kobe beef. I learned there is no way to place an order on their website! Why not???! I learned that their franks 'snap' when you eat them! Sounds yummy! I learned that Kobe-Crafted beef is the perfect formulation of American Kobe-Style beef and traditional beef. Products are crafted from Wagyu beef, my son's favorite beef place at our local Sushi hangout. They're Kobe-crafted. I'm too poor to try Kobe beef! I learned that All Steakhouse Elite Kobe-Crafted products are produced at USDA-inspected facilities to ensure the highest standard of production and food safety. Steakhouse Elite Franks are 100% Kobe-Crafted Beef. They sound so good. The vision of the company started out with two veterans. I learned this: Coming from a family that was among the first in the U.S. to raise and sell Wagyu cattle, Ty sold his first pound of Wagyu beef as a teenager. I learned that all products are produced at USDA-inspected facilities to ensure the highest standard of production and food safety. They use 100% American raised Kobe-style beef! I learned that the company was started by a butcher and a cattleman. Their meat has a velvety texture and buttery flavor. Looks like good products to try! I learned they use American Kobe-style beef. Steakhouse Elite operates from its offices in both New York and in Oregon. I learned that: Ty sold his first pound of Wagyu beef as a teenager! So cool. I learned that Ty sold his first pound of Wagyu beef as a teenager. I learned that Evan is a second generation butcher and meat expert. I learned the owners are veterans. Steakhouse Elite grew out of a vision shared by two veterans of the beef industry who happen to live on opposite sides of the country. this is an east coast- west coast operation! I learned that they are Kobe crafted. I learned that the products are produced in USDA-inspected facilities. They provide affordable US raised kobe beef crafted products. I learned that Ty sold his first beef when he was just a teenager! How amazing! I learned that they operate from offices in both New York and in Oregon. They also provide service to large retailers and distributor partners nationwide with a 100% guarantee in satisfaction! I learned they are in the Bronx area of new York! One of the owners, Ty sold his first pound of Wagyu beef as a teenager. 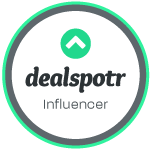 I learned Steakhouse Elite enhances American classics with flavorful American Kobe-style beef to deliver a true lifestyle upgrade at an affordable price. 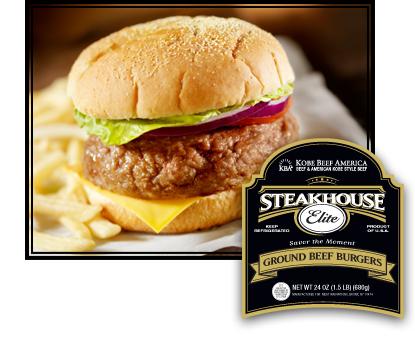 Steakhouse Elite enhances American classics with flavorful American Kobe-style beef to deliver a true lifestyle upgrade at an affordable price. I learned that the cows that are used originally came from Japan , now they are raising that same type in ths US. I learned they have two locations Oregon & NY!! I learned that their hot dogs are 100% KOBE-crafted beef! All Steakhouse Elite Kobe-Crafted products are produced at USDA-inspected facilities to ensure the highest standard of production and food safety. We insist on only the finest 100% US raised beef for our customers, because our top priority is your 100% satisfaction. I learned their start came from a cattleman. They only sell 100% US raised beef! I learned that Steakhouse Elite has offices in both New York and in Oregon. I learned they are masters of American Kobe beef. They insists that 100% of the beef is raised here in the US and they have two offices... one in New York and the other in Oregon. They insist on only prime 100% US raised beef for their products. I learned that they use Wagyu beef. I'd never heard of that before. i learned that they only use American beef! I learned that they enhance American classics with flavorful American Kobe-style beef to deliver a true lifestyle upgrade at an affordable price. I would love to try it! They are masters at crafting American Kobe-style beef that is widely known for its velvety texture and buttery flavor. Their hot dogs are 100% skinless beef franks!! Yum! I learned that Kobe-Crafted beef is the perfect formulation of American Kobe-Style beef and traditional beef to produce products rich in flavor and ideal in texture. Ty Freeborn came from a family that’s been in the cattle business for five generations. Just wanted to ask "whats with all the 'canned' comments'? Steakhouse Elite Kobe crafted are not 100% Wagyu. I thought so too, my kids have always loved them, but when they came out with the grass-fed line I asked the company and they said they mix Wagyu with "commodity muscle meat" which, if it concerns anyone, is not hormone/GMO free. They are very tasty, but they are not as pure as I thought.